Regular readers of this blog – and I appreciate you both, by the way – are no doubt saying to yourselves, “What is an ‘express review’? There has never been an ‘express review’ here before!” And you are absolutely right. An express review, briefly put, is not a real review at all, but would like to be one when it grows up. It is – and this is the defining quality – too short. I never wrote short reviews until I joined Goodreads, and it is that, and not a shortened attention span due to excessive video games, that has led to this abbreviated review. So here is my express review of Becky Miller’s Power Elements of Story Structure, which luckily is longer than its own introduction. In this brief instruction book, Becky Miller examines the ‘bare bones’ of a story – beginnings, middles, and endings, and the basic elements of tension, plot, backstory, and foreshadowing. She carefully defines and explains each of these, and then advises authors how to create them. This book is spiced with excerpts from contemporary novels and (what is more fun) fairy tales, used for illustration of various points. Becky also weaves in quotations from a plethora of authors, all interesting enough to make the bibliography she provides at the end noteworthy. A few writing exercises are included. I didn’t do them, actually, but they did make me stop and think. In fact, I paused, throughout the book, to consider it and (I admit it) to evaluate both my most recent manuscript and my newest effort. 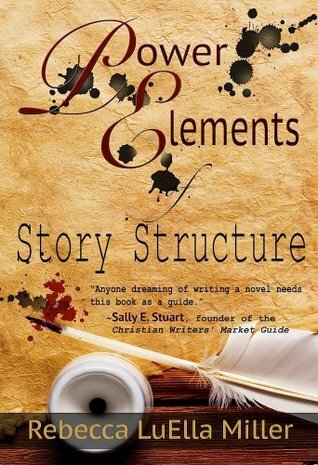 Power Elements of Story Structure is written with great clarity and lucidity, cutting a clean line between the lowest common denominator and esoteric heights. Most helpful to new writers, but interesting to any writer who enjoys the study of his craft. I finished wanting to read the next book, Power Elements of Character Development. And the story of the monkey and the crocodile. And that, readers, is an express review. But the question remains – what happened to the monkey? I hope he didn’t get eaten, but fairy tales are vicious like that, sometimes.